Opening hours: Most shops are open Mon-Sat 9am-5:30pm but some of them may close down earlier on Saturdays, while others may also establish independent opening hours. Alice Springs is a great base for a holiday in Central Australia, so do allow at least a week to see the town and the surrounding area. Although you will likely still barely scratch the surface of what there is to do and see, the following spots should not be missed. 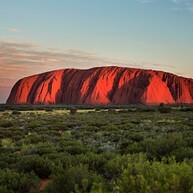 Distance in Australia is a whole other thing to compared what you are probably used to, and Uluru (or Ayer's Rock) is approximately 450 km south west of Alice Springs – considering the vast distances existing in Oz, that is practically nothing. The large sandstone formation is pretty much in the middle of nowhere, and the ground is sacred to the Aṉangu, the Aboriginal people in this area. 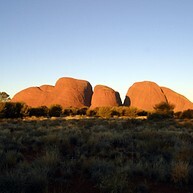 Kata Tjuta, also known as Mount Olga or The Olgas, is similar to Uluru but different in shape. 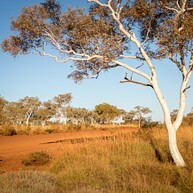 Lying only about 365 km south west of Alice Springs, it is – compared to its 'sibling' Uluru – only a stone's throw away, and definitely worht a visit. 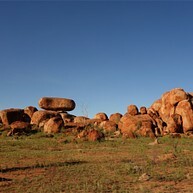 Karlu Karlu, as the Aboriginals say, or The Devil’s Marbles, are gigantic and rounded granite boulders spread across a valley, and they now belong to one of the main tourist attractions in the Northern Territory. While pathways with information boards and a camping area on the grounds allow to experience this sight all year long, rangers offer an exciting program of live events between May and October. For a fantastic first glimpse of Alice, you should wander up to this war memorial from where you can also savour in the city's beautiful surroundings. 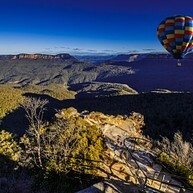 This viewpoint is best visited at sunrise or at sunset, so start or finish your day right by heading up here. This park is a great introduction to the plants, desert habitat and animals of the area, and you will definitely need a full day to explore it all. Also, learn more about Aboriginal culture, and do not miss the free staff talks, the birds of prey display or the hourly film. This museum contains three different departments – Road transport Hall of Fame, Kenworth Museum and Old Ghan Road – that are all committed to provide a nostalgic trip into Australia's transport history. While the original carriages of the historic Ghan railway are on display, you can also enjoy a traditional morning or afternoon tea inside a narrow gauge locomotive. 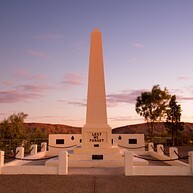 Step back into the pioneering age and the birthplace of Alice Springs, by vising this historical reserve displaying the story of the connection of Australia to the rest of the world. 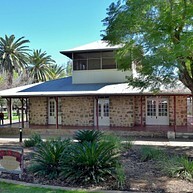 The beautifully restored buildings will inform about the telegraph's history and its huge importance for the town, as well as about the impact of the war years, and the stolen generation as well. 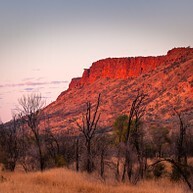 These fabulous mountains stretch for 644 km both east and west of Alice, with numerous waterholes, beautiful gorges, historic sites and Aboriginal rock art as well as plenty of walking trails, wildlife and good bush camping. Some places are within a reach of 10-20 km from town, so head here and enjoy its rich atmosphere. This historic building is one of the town's most unique heritage places, and erected for government residents back in 1928 already, it even hosted Queen Elizabeth in 1963. In the inside, local history and historic events get displayed right next to the toilet or ’royal throne’ that the Queen used during her stay. .
Adelaide House was the first medical facility in Central Australia, as it opened back in 1926 with only two nurses and designed by Reverend John Flynn of Royal Flying Doctor Service. Remaining the only medical centre in this area until 1939, the building today displays the local history and the pedal radio Flynn and Traeger used back then. 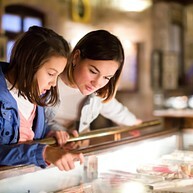 Araluen Cultural Precinct is a fantastic complex displaying local cultural and natural history, including the Namatjira Gallery, Aviation Museum, Memorial Cemetery and Museum of Central Australia. While there are also sacred sites and trees of significance to Aboriginal people, you will definitely learn a lot about Australian culture and significance. The Royal Flying Doctors Service is a non-profit organisation aiming to provide emergency and health services for people living in regions without direct access to hospitals and doctors. 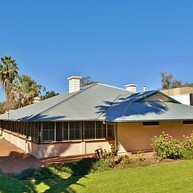 One of their main stations is situated in Alice Springs, and it is accessible to the public. Here, at their museum, you can get a glimpse of the flying doctors' job as well as of their rescue helicopters. Founded in 1993, the museum hosts changing exhibitions about females in pioneering positions such as sports, politics or art, and thus captures the lives of exceptional women in Australian history. The place also holds the Old Gaol museum where you can learn about prison years from 1938 to 1996. Experience Alice Springs from above with Outback Ballooning Tours, and you will just in time for sunrise fly high over the beautiful landscapes surrounding this area. One balloon carries 2-20 passengers so you can join as both a whole group and a small family, and good weather conditions will make your flight a memorable experience. With Wayoutback, you can get a number of tours in Central as well as Eastern Australia, and next to day trips to Ayers Rock, you can book 3-7 day tours to different regions with various activities from classic sightseeing to adventure hiking. Choose your personal trip through Australia in their wide offer, and you will experience this interesting country at its best! This place was founded in 1956 as a botanical reserve, and it offers visitors over 600 different plants, and among them rare trees and flowers from all over the region. Enjoy a walk through nature’s beauty and rest in the cosy Bean Tree cafe nearby, after discovering the fascinating Australian nature, flora and fauna.